All motorcycles have a natural state of being. A place that is not only a perfect fit but helps define the purpose of that motorcycle. Sport bikes belong on twisty sections of two-lane roads, a cruiser is truly at home on the wide-open prairie, a dual-sport won't hit its stride until the pavement ends. For the K1200LT its natural state is moving you from one end of this country to the other with a minimum of effort. BMW's luxury touring bike has reinvented the class and is gathering a strong and loyal following. BMW, like most manufacturers, throws a long set of numbers and letters at you to describe their bikes. So here is a little primer as to what they mean on current bikes. First, there is the one of three letters that starts out any model designation. They are R, K, or F. This letter denotes the engine type, R is for the flat two cylinder opposed air-cooled bikes a.k.a. boxers or oil-heads. K is for the water-cooled flat four (and older three) cylinder motors known as "flying bricks". The last and newest motor style is the F, a vertical single cylinder which has no nickname I know of yet. Next comes a set of numbers, which is simply denoting the engine size in cubic centimeters. The last set of letters is an indication of what type of bike it is, i.e. the C in R1200C stands for cruiser, GS is German translation of land/street, or RT is rally/tourer. This brings us to this month's test ride the K1200LT. As you can see from its model designation hidden beneath all that bodywork lies the newest version of BMW's venerable K motor. Developed in the early eighties, the K motor has seen continued to be one of the main stays in the BMW line. Enlarged to 1173cc and reworked to produce 100 horsepower at the crank, this newest version of the K is a wonderful motor that balances power with fuel economy while being ultra smooth. The K12 motor has 4 valves per cylinder and dual overhead cams. Then combine fuel injection, a catalytic converter and Bosch Mototronic engine management and you have a powerplant that runs clean, smooth and strong. Like to run a lot of gadgets or want the absolute biggest driving lights money can afford? The LT come with a 60 amp alternator that puts out 840 watts. For those fuzzy on what number like that mean, my first car had only a 30-amp alternator and many modern cars use 60-amp alternators. The gearbox is a 5-speed unit and the clutch is a very European single-plate dry-clutch and hydraulically actuated. The final drive is a shaft the runs through BMW's patented Paralever rear suspension. The Paralever is a single sided swingarm that has been designed to eliminate the jacking effect of shaft drives. I'm not really clear how the geometry works but I can say this, it works. The rear of the bike stays steady regardless of what I do with the throttle. The chassis for the LT is a large cast aluminum piece with the motor hanging below it as a stressed member of the frame. Interestingly the LT shares it frame with its sport touring brother the K1200RS. The fact that the LT shares so much with the RS reveals how sporty the engineers really wanted the LT to be. The front suspension is the BMW Telelever which does not use conventional forks. Instead the fork tubes are given only one job, hold the front wheel. A V shaped swingarm that runs from a brace hidden by the front fender back to the frame and is held up by a conventional mono-shock handles the suspension duties. It may sound a bit complicated but in practice it works like as charm. Under heavy braking the front end does not dive at all. The front wheel tracks well over pavement ripples and the shock soaks up all but the sharpest bumps. The lack of front-end dive has added benefits as well. While braking hard the suspension continues to soak up and bumps you encounter keeping the front wheel planted. Also the front end doesn't get that heavy steering feel during braking giving you greater control especially during emergency maneuvers. The brakes are a pair of 12 inch rotors pinched by 4 piston Brembo calipers up front and a single disc in back. The brakes are strong and linear but their greatest asset lies in the fact that they are controlled by BMW's second generation ABS. This feature should be standard on all motorcycles not just the high end machines. The confidence the Anti-Lock gives when stopping in all conditions is wonderful. In an emergency you simply hit the brakes as hard as you can, no need to think about over braking and losing control. The ABS works seamlessly, I have been unable to get anything more than a chirp out of the tires while slamming on the brakes and it has never been intrusive. You really forget it's there until needed. The top of the line and price heap is the Elite model, which includes all the goodies previously mentioned, and also adds the integrated communication system and CB radio. The com system is a very nice feature, which allow rider to passenger communication as well as the ability to hook a cell phone or two-way radio radar detector into the com system. The CB is also a great tool on the road and is often the standard form of bike to bike communication. The Elite also adds BMW's newest feature a GPS receiver made for BMW by Garmin. For those who have never used a GPS, it is a very useful tool that make navigating on the fly easy and makes getting truly lost next to impossible. For those acquainted with GPS I need not say anymore. Enough about all the bells and whistles. How does the K stack up against the other players in the touring market. The K12 was aimed straight at the Goldwing 1500 and has done a fantastic job of raising the bar. Enough so that Honda hurried the 1800 Wing to market. The power of the 1800 may be greater than the K12 but you pay for that in decreased fuel economy and marginal range. And when the interstate ends and the twisties begin you'll want on the LT. The combination of great suspension, brakes and cornering clearance makes the LT the winner on anything other than a straight line. We recently had the chance to run the LT around a real race track and found that despite it huge size and weight it was fun bike to throw around a track and blasting out banjo music through the stereo keeps the corner workers and competition guessing. The LT is rather top heavy and while this makes it unwieldy at time in parking lots once you open the throttle the weight just disappears. On the open road the LT gobbles up miles like me at a Chinese buffet. 1000 mile days are very easily knocked down. This all thanks to a very comfortable neutral riding position. Even after back to back 1000+ mile days I was always looking forward to getting back on the bike. The is the first machine I've ridden where I wished for even greater fuel range because I just didn't want to get off. Therein lays the LT greatest charm, you just want to keep riding. All the goodies and options that seem unnecessary become very appreciated and eliminate many of the distractions that take away from your ride. BMW is a small player in the US, steadily holding 3 to 4 per cent of the motorcycle market. While they are found everywhere, they aren't seen every day, unless you work for Senior Editor Wanchena. For those who aren't familiar with their products, the K refers to the inline 4-cylinder, 4-valve/cylinder motor family; the 1200 alludes to the new, larger (duh) displacement, and the LT stands for "Luxury Touring." 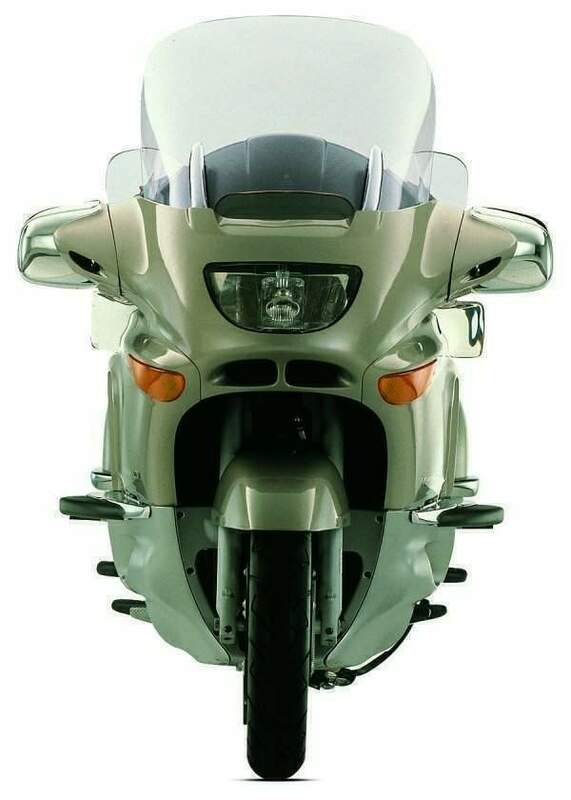 Even though the touring K1100LT was introduced just before the sport-touring K1100RS in 1993, both bikes were developed on the same platform. The factory took their excellent sport-touring K1100RS platform and saddled it with touring amenities. 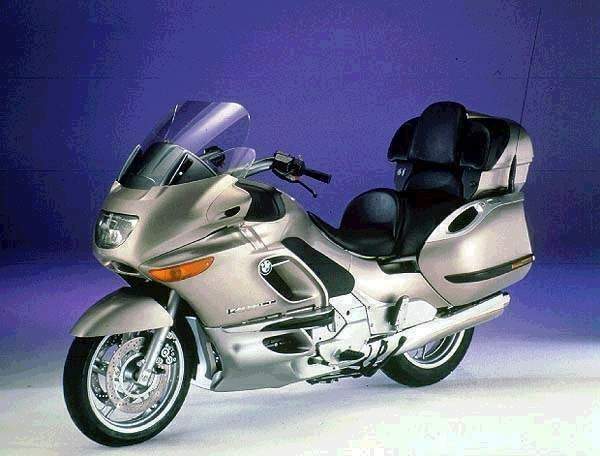 While a good bike on its own, it didn't have the refinement of the then-new 1500-6 Goldwing. 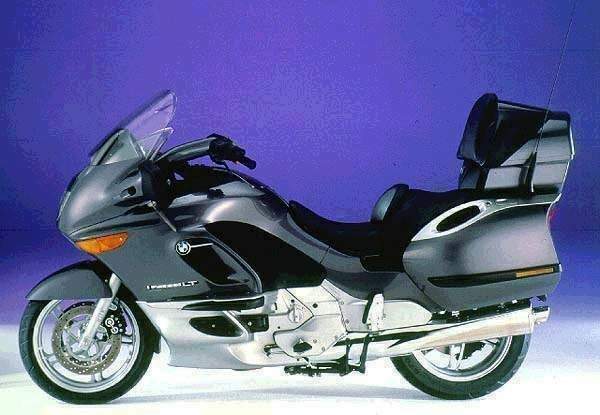 Wing riders weren't swayed by the BMW's performance, and BMW riders didn't appreciate the added weight and expense of the touring equipment. In addition, the stereo sucked. Sales of the K11LT were lukewarm. How does she stack up to the 1500-6 Wing, BMW's obvious target? The LT comes ready-to-tour with the following goodies: reverse-assist to aid parking; an 840(!) Watt alternator with enough juice to power his and her electric clothing, auxiliary lights, the CD changer and a coffee maker; and a seat that adjusts to either 31.5" or a bootscraping 30.3"
Of course, all locks are keyed to match the ignition. One key does it all here. Both clutch and front brake levers are adjustable. The LT has one-button 4-way hazards, and MMM asks again, "Why don't all motorcycles come with this cheap and practical feature?" A 6+ gallon tank coupled with 43-odd mpg gives a respectable 250+ mile range, including reserve. The K1200LT was an immediate hit. The American moto press praised it highly, earning laurels from touring-based Rider magazine and "Best Touring Bike" from Motorcycle Consumer News. Hell, our Senior Editor sold off the old horse and promptly bought one. 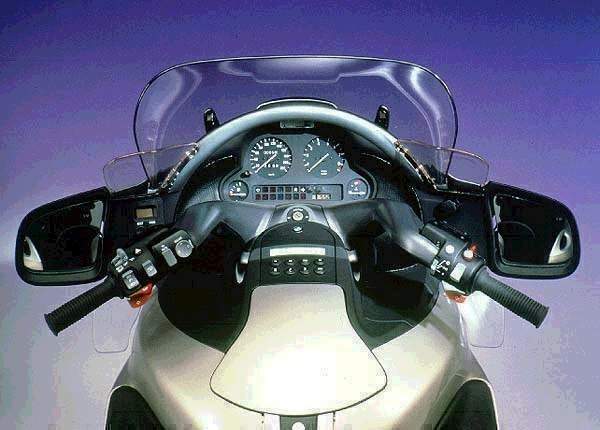 American Honda was stunned, and pushed an early release of the rumored 1800-6 Goldwing. When a small manufacturer forces the largest player in the US market to react to a product, you know they have a success. OK, the touring set likes it, but what is it like to ride? BMW didn't leave performance out of the recipe. The K12 comes with an aluminum frame, triple disc brakes with 2nd generation Anti-Lock (ABS II), 4.5" of ground clearance and Z-rated rubber. The motor puts out 100 horsepower and is both injected and made pure through dual catalytic converters. This new motor rocks. It is torque heavy, so all you need do in any gear is roll on the throttle. Add a downshift, and the thrust will surprise you. The 1200 LT hides its honest 834 wet pounds well. It is almost flickable. Steering is light and predictable and it is easy to 'slalom' between highway dashed lines at 65 mph (closed course, professional rider, kids; don't try this at home, blah blah blah) One oddity is the tiller-like handlebars. I felt as if I were riding an antique flat-tanker. I'm not sure if they are a styling decision or a leverage call, but an owner would soon grow accustomed to their feel. The styling, while unified, is somewhat alien. It certainly is unmistakable. Some riders liked that the integrated luggage "didn't look tacked on," and that the fairing provided "decent coverage." Others felt it all looked "swoopy" or "plastic-ky"
The dash is complete and legible. The large analog speedo and tach are complemented by accurate fuel and coolant temp gauges. Also included are a digital clock and the 'BC' window. With this feature (Bavarian Computer?) you can cycle through air temp, remaining range, average speed and fuel mileage functions. Wife's First Reaction: "Wow. It's a big, SPACE-ship bike…"